the thirty-three candles have been blown out and i am happily wearing my wedding-day tiara this evening (because what other day can you wear it?) after have a really, really good day. when the blue sky arrived in the early evening, i took jonny to my new favorite spot over in gig harbor where we walked through the woods and arrived at the water where we sat and watched the sun glisten off the sound. it was nice to just breathe and be for a few moments. we talked about the adventures we hope to take this summer. and i resisted the urge to just kick off my shoes and walk straight into the water and twirl. i knew that the dream of that moment was a bit more beautiful than the actual experience would be. still, it was fun to think about. i started off this morning enjoying a doughnut (or two) and watching "sunday morning." (oh how i love that show.) this morning, there was a segment about rosie*. one of the girls who participates in her broadway kids program said this, "performing just lets me express everything i've been shutting up all day. coming here. it's like freedom." and as i nodded while listening, i suddenly had this thought: this is why i have a blog. because coming here is like freedom. and in this place and through the connections i have made, i have found my way back to myself. this is a beautiful realization on this day. and on this day, i want to say thank you to you reading these words. you have invited me, with your kindness and validation and nodding and extension of friendship, you have invited me to show up as me. you have enabled me to unearth this gift of freedom. yesterday, i spent the day in the little room. i haven't played with fabric in...sigh...months. 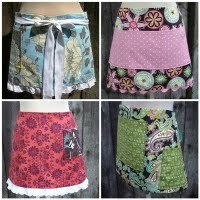 and it was so much fun to begin to create a new group of natasha aprons. 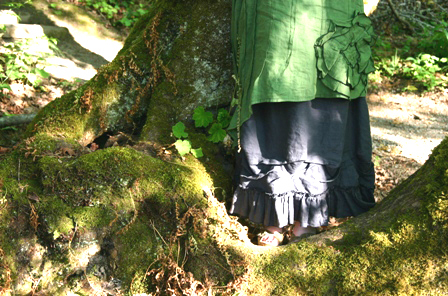 i sang and danced a bit as i cut fabric and chose pockets and pulled out some trims. one thing i have learned in the last year is that creating custom orders stresses me out more than i wish i did. (i really do feel so bad about that.) i think it is the deadlines. i really just have a hard time with deadlines for fabric items as i fit in my full-time job and working on the be present retreats and other things and, you know, living. having said that though, i had this idea last evening: what if i did a giveaway every now and then for a custom fabric creation? i could let go of the very specific timeline this way while still experiencing the fun of focusing on someone while creating something for that person. 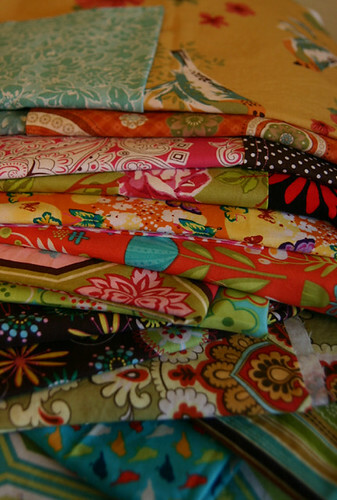 which leads me to this: i would love to giveaway a custom natasha (reversible) apron! and thanks again for just being you out there living in your lives. *watching the tap dancing (aka time steps) during the segment about rosie made me totally want to start tapping again. i think i am going to find myself some tap shoes and maybe take a class this year. yes, i think i am going to dare myself to do this.